The C4 Chevrolet Corvette absolutely dominated the the SCCA’s showroom stock Endurance Championship in 1985, 1986 and 1987. 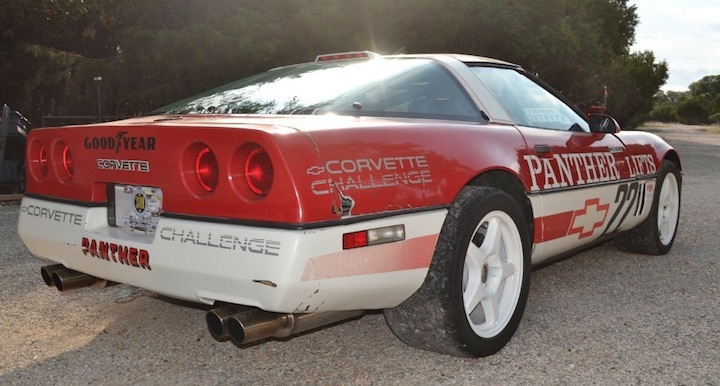 With predictable outcomes threatening to put a damper on both manufacturer participation and fan attendance, the SCCA banned the C4 from the series, forcing General Motors’ marketing division to look for other ways to advertise the Corvette to racing and performance enthusiasts. They asked chief Corvette engineer Dave McLellan for ideas, who proposed a one-make racing series, and the Corvette Challenge Series was born. A cost controlled championship featuring identical C4 Corvette race cars, the Corvette Challenge Series produced close racing and proved to be a good stepping stone into faster series. A number of notable racers came up through the Corvette Challenge Series, including former Corvette Racing and Cadillac Racing driver Andy Pilgrim and Indy 500 winner Johnny Rutherford. Olympic gold medalist Bruce Jenner, now Caitlyn, also participated in a handful of races. Chevy pulled its backing from the Corvette Challenge Series after just two seasons and the SCCA eventually ended its ban on the Corvette in production car based racing. Some of the cars used in the series are still floating around out there, though, like this one that recently popped up for sale on eBay. This car, which has a ‘Buy It Now’ price of $35k, is race ready and is still legal for use in series in accordance with FIA/SFI safety regulations. As Hagerty reports, all Corvette Challenge cars were ordered from the factory with the B9P option code, which included the Doug Nash 4+3 manual transmission, Z51 handling package, a six-way power driver’s seat, a Delco-Bose stereo and more. They were later converted to race spec by Protofab in Wixom, Michigan, – now known as Pratt & Miller, the same guys that run the Corvette Racing program. Check out the listing for this unique Corvette Challenge car at this link for additional information and photos.